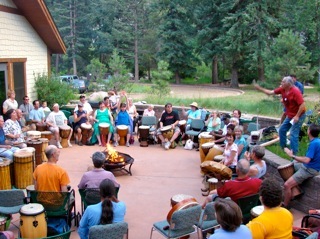 Probably one of the oldest forms of humans gathering to celebrate or meditate is the community drum circle. The purpose is to include everyone and anyone who wants to participate. That could mean not only drums and percussion, but playing any other musical instrument as well as dancing and singing! I'm talking about trees, flowers, water, butterflies, squirrels, etc., etc. We all love music, and drumming music tends to vibrate a little further and can therefore 'communicate' for miles around—even if it's not heard, but felt. “WE CAN'T DO IT WITHOUT US—ALL OF US!" —See ya at the circle. Kissidugu: a West African Performance troupe under the direction of Master Drummer and Dancer, Fara Tolno. www.cherishanti.com for local djembe classes, drum circles, and community events.